Samsung is always the big rival to Apple. Not only in their Smartphone line, but both companies also compete with their Smartwatch product line. Every time one of them releases its new flagship, we can predict that soon the other one must release its new flagship product too. This is the same pattern that’s cycled over and over between these two technology moguls. So, remembering that currently Apple has released its new smartwatch flagship, the Apple Watch Series 3, will we see another Samsung smartwatch flagship soon? Will Samsung Gear S4, as it’s predicted to be named, will hit the market within 2017 or later on 2018? Let’s find out. It’s been a year since the release of Samsung Gear S3, which is definitely a favorite of gadget lovers. Even for now, this smartwartch is still on the top list of best smartwatch in the market, going face to face with Apple smartwatch line. But, 1 year seems old enough, doesn’t it? And many people want some refreshment from this South Korean big brand, especially when the rival has released its newly refreshed smartwatch, making the curiosity toward the new Samsung Gear S4 getting wilder. The Berlin IFA Consumer Electronics Show last August was a drop of hope to see Samsung releases its new speculated Gear S4. But, this highly anticipated smartwatch didn’t show up at that time. Instead, the company announced its updated fitness tracker which is Gear Fit 2 Pro Sport. Just for your information, this tracker now got new 1.5 inch curved Super AMOLED touchsceen display. Then, what will we see on the new S4 smartwatch? By not showing up in the annual IFA electronics show event this year, it leaves rumor that Samsung is still in the development process of this wearable. Apparently, the company wants its new Gear series to be really well developed before making its first appearance. Then, what’s expected to be offered by this new Samsung Gear S4? Here’s the list of it based on some trusted sources. This is a patent that highlights watch strap with flexible screen on it. So, instead of reaching menu button in the small tiny display, you can easily access them through the shortcut pinned in the watch strap. It’s actually not something new as Samsung has already registered a patent of watch strap with flexible screen on it quite long time ago. This is the patent that was supposedly to be applied on the previous Gear S3. However, Samsung didn’t make it. And by this, public expect to see the new Gear smartwatch will use this technology. We must’ve known about Alexa, Google Assistant, Siri, or Cortana. But Bixby? Maybe, it’s just some of us familiar with it. This is a virtual assistance developed by Samsung. Firstly launched along with Samsung Galaxy S8 and Galaxy S8 Plus, Bixby is expected to show up in the new Samsung Gear S4 to increase user experience in using this Samsung wearable device. Further, with some new features on Bixby that was announced when Samsung releasing Galaxy Note 8 some time ago, the collaboration between Bixby and Gear device is really worth waiting. Bixby is getting smarter. And unlike other virtual assistance, we can say that Bixby is simpler. It can perform various tasks such as changing setting, grouping photos into album, and others only by giving a simple command. Faster processor is such a must for new device released. And this is also expected to happen on the new upcoming Samsung Gear S4. Many experts predict that the new device will have Exynos 7 Dual-core 7270 processor that runs faster than the previous one. This processor will also be supported by longer battery life as well. Surely, this combination will result on better overall performance especially for running applications. Another patent that was registered some time ago by Samsung is a patent for special watch case. This was predicted to be applied on Gear S3, but the expectation was gone when Gear S3 released without this special case. By this patent, Samsung intends to create a watch case with charging capability. So, user can charge their Samsung smartwatch easily and instantly simply by placing the watch on top of the case. Remembering that Samsung new fitness tracker got significant update on the display, it’s not too much if we expect the new Gear S4 to have better and more innovative display. Furthermore, new Tizen 3.0 OS is also expected to be applied. This is an OS with 64 bit compatibility which claimed to be 30 percent faster than the previous Tizen 2.4. In addition, this OS can play 4K video as well. 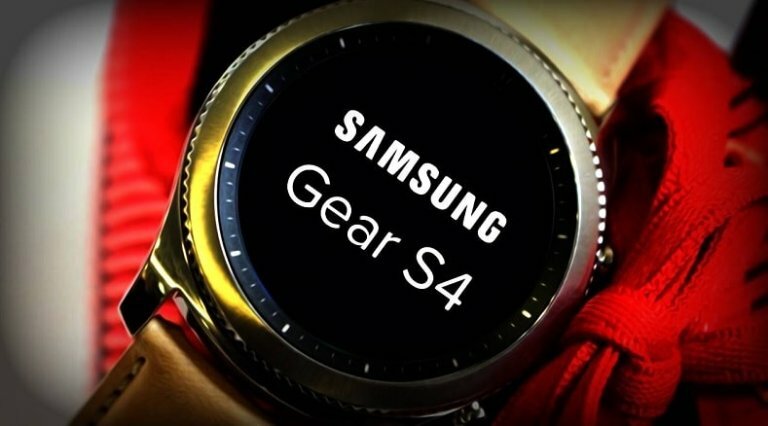 If all those expected features are real, then Samsung Gear S4 may cost a lot, at least it will be more expensive then the Gear S3. If the previous S3 was sold in around $349, we estimate that the new updated device will cost around $380. While for the release date, it seems like we have to wait for the next IFA event in 2018 to see this new Samsung Gear S4.